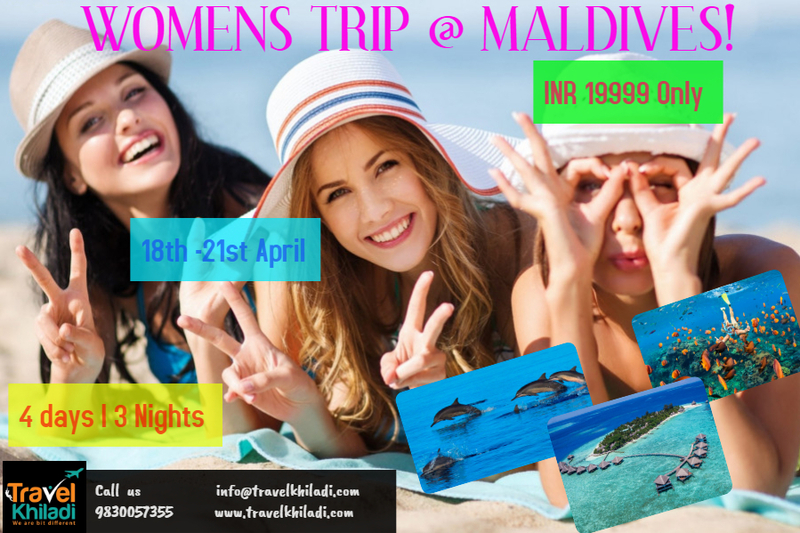 WOMENS TRIP TO MALDIVES : From the warm waters of the Indian Ocean to the traditional tranquility of local island life, the Maldives is one destination where doing absolutely nothing can actually mean absolutely everything. Diving over coral reefs, island hopping by small ship or exploring ruined temples; yes, Maldives holidays can be an active break but if you're hoping to absorb the essence of Southern Asia then flick off your shoes, lay back, relax and tickle your toes with pure white sand loveliness. Our Maldives Magic​ ​trip​ ​gives you the chance to see the real Maldives and to discover the culture, beautiful scenery, friendly local people and atmosphere of this tropical paradise while staying in comfortable locally owned Hotels. Why should boys have all the Fun..enjoy 3 day relaxing trip to Maldives, enjoy with new friends, explore the white sand beaches, fun with beach volleyball,private island and more.. In the evening enjoy and play the Beach Volleyball. Note - Snorkeling equipment included. Today after breakfast, relax and enjoy the scenic beauty of Maldives. Or you can opt for any of the below activities by paying additional cost. Private Island Visit- Make a day trip to one of the​ ​Luxury resorts and see what resort life is like. Sometimes its better to explore some amazing​ ​Water Bungalow Resorts which cost more than 35000 per night rather than staying there. Spend your day enjoying facilities of a luxury resort and indulge yourself! You will be transferred to the resort by speedboat. Once you reach your destination you will be able to experience resort services and discover the luxury side of life. Relax , enjoy and spend time with your loved one here. Awesome place for photography with the Water Bungalows. Scuba – Dive in the waters and explore the life underwater. Maldives is one of the best places in the world to spot manta rays and whale sharks. Big schools of jackfish patrol the reefs, morays and turtles are also very commons. The reef enjoys both soft and hard, colorful corals, and tons of little fishes, nudibranchs and worms. ​Stay for 3 Nights in Maafushi island in a 4* Hotel [Beach Resort].